Me too ---- eToro deleted my copied trades too!!! In January 2019 I started to use eToro for copy trading and I copied one local trader that I found through their platform. After a few weeks eToro sent me an email with a wavier where they said they would DELETE the good trade because of abusive trading. But I am copier !! The wavier also said that I givie up any claims to any profits that I may now or in the future. Of course I did not want to sign this and later on they closed my account, returned what was left on the account and DELETED PROFITS FROM COPY TRADING !! So it's fine to loose mony as long as you dont win some. Any profits made through copy trading can simply be deleted by eToro. Losses stay ... Clearly to SCAM !!!! This means your social trading is just to take money from you. I am client of etoro for near two years. I traded in the past myself but last half year I am following people and copy their trades. I was satisfied until they withdrawal money but one week ago I received email about delete profits from this year that I violated T&C. 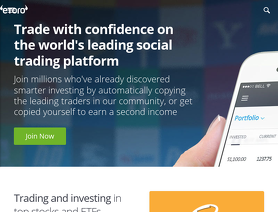 I have copied trades with their social trading platform. They are excusing that trades were wrong. This is ridiculous that they delete trades! Trades were copied automatically. I can not been responsible of that and I can not be a victim of this. Their managers push to copy traders to make more trades and they earn from spreads. I think this is SCAM and very good example that you can not TRUST to etoro because someday can everyone get this email and they will not pay you earned profits. Where is point to use them social trading platform if they delete profits and their excuse is about something which you can not influence. I have been trading with Etoro for a while now dough I have only made small deposit I find the site to be reliable, also have made withdrawal and find it reliable in that area as well. With all the disappointment going on with most trading sites I have find myself looking at Etoro to soon be my #1 trading site. if they had the Metatrader 4 platform I wouldn't bother much with other trading sites. Their platform is very good don't get me wrong I just prefer the MT4 platform; I give them a 4 star not because they don't deserve a 5 star is for the lack of MT4 other than that kudos to you Etoro. I have been using it for 5 years now, high fees, but it is really easy to use, and powerful at the same time. Only part I see they have some issues is related to the crypto market..
Not to trust. Do your researc about this company before Starting to use it. They can block your account just because they want to. I been warned by MANY cryptoholders to not use Etoro at all, i picked competitors that actually lets you withdraw at any time or transfer the holdings to another wallet free of choice! if possible I would like to give them -ve ratings. worse broker for traders and IBs, the just steal clients money however they can. ive an partner account with them. for few years. as their spreads are very high and platform is not mt4 hard to get client for them. for last few months my commission earnings increased to 400-600 usd avg per month. some time it goes passes 2k as well. and then suddenly my account manager informed me that due to regulation issue they are not paying commission to affiliates. only cpa they are offering. I mailed several times to my account manager asked her why others partners are offering rev commission to their clients. she just ignoring those question and repeat one thing that due to regulation issue they are not paying to affiliates any rev commission. for last few months I saved my accounts earnings and contact them to release those but they denied and now they just not updating my accounts at all. so I don't know how much my referrals are generating. today they just blanked my account earnings. Except from the spread they charge $25 fees just to withdraw your funds. Also the withdrawal request takes too long to be added in your card.